The exhibition “The Artist-Sorcerer”, organized by the Tretyakov Gallery to mark the 160th anniversary of Ivan Pavlovich Pokhitonov (1850-1923), featured works from the collections of the Tretyakov Gallery and Otar Margania (Moscow). The dates of the exhibition, initially scheduled to run from March 2 to November 28, were twice extended due to the great public interest in Pokhitonov’s oeuvre. Visitors to the show in their comments talked not only about gratitude for “the feeling of joy and harmony of life” they experienced viewing Pokhitonov’s works and admiration for the artist’s consummate workmanship, but also about his painting techniques, which were described as “spellbinding” and appearing “a miracle”. As if echoing Ilya Repin’s opinion about Pokhitonov - “this is an artist-sorcerer”, which gave the title to the exhibition - viewers wrote that they visited the show several times to engage with this “miracle” again and again. 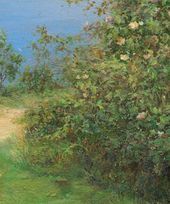 Two of Pokhitonov’s paintings, reviewed in this article, help to partially illuminate the secrets of his creative methods and the origins of the ideas for some of his pictures. 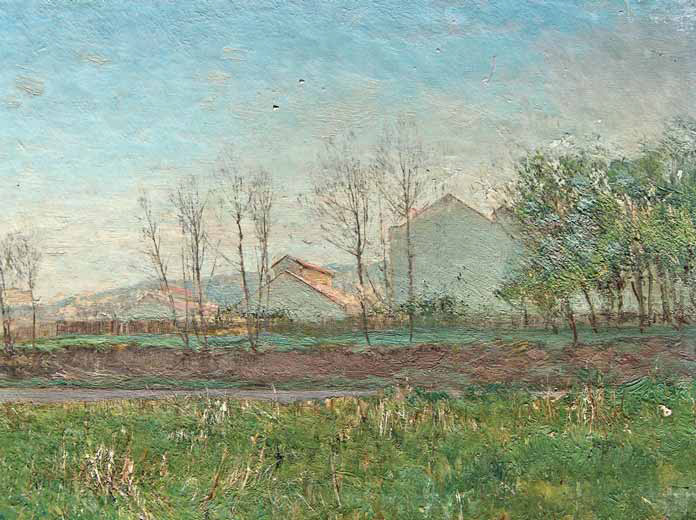 One is “A View of Bougival”, which was submitted for authentication to experts from the Tretyakov Independent Art Authentication insititution after the opening of the anniversary show. Until recently the piece had been held by the artist’s family — descendants of his younger daughter Zoya Pokhitonova-Markevich (1888-1972) — and was then bought by a Moscow collector at an auction in Paris. The investigation of its stylistic and technical details, and the comparison of “A View of Bougival” with Pokhitonov’s classic works held at the Tretyakov Gallery — in particular, his picture “Early Spring. Pau. Laundrywomen on a Bank of the Gave de Pau” (1885) — confirmed Pokhitonov’s authorship, revealing resemblances in composition, palette and brushwork. The research findings suggested that “A View of Bougival” was created in the late 1870s-early 1880s. Such a tentative dating does not conflict with the results of the chemical analysis of paint pigments made at the research laboratory of the Moscow Museum of Modern Art. This scientific analysis revealed the complex structure of the layers of paint, which lack the homogeneity usual for an artist in the process of work on a single painting. In Pokhitonov’s picture, each of the planes was created using different techniques — the artist re-fashioned the planes at different periods, using different methods for each. At the start, he outlined the composition of the landscape with quill and ink over the priming. Then the outlines were mostly painted over but remained in some places — in the delineation of the river and the roofs of the houses. 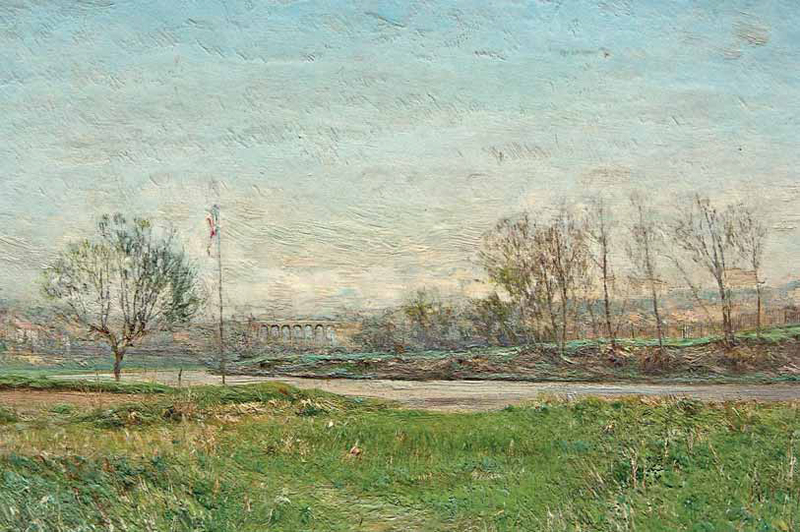 The paint layer in the foreground was scraped away almost down to the priming, then the lines of the fencing were traced, with a tool akin to a comb, over fresh, still wet paint; then the artist used tools with pointed tips to scratch on paint, also wet, the lineaments of grass-blades in the foreground. The structure of paints in the background is different. 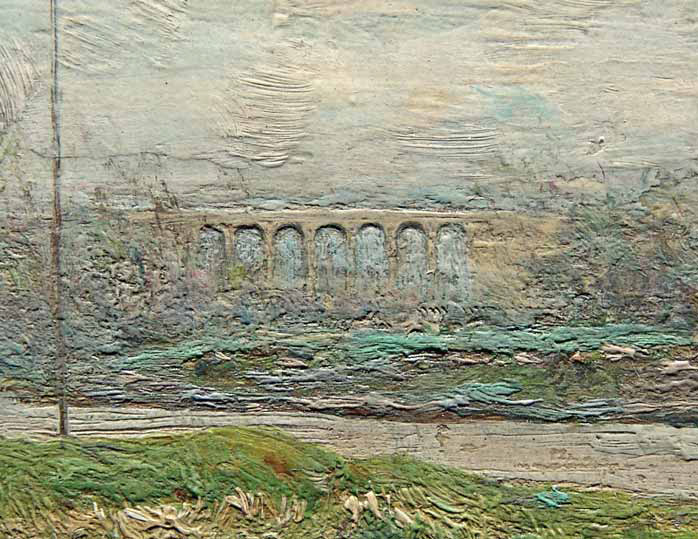 The lines of the aqueduct were pencilled over the upper layer of paint. This detail of the landscape was re-worked several times. 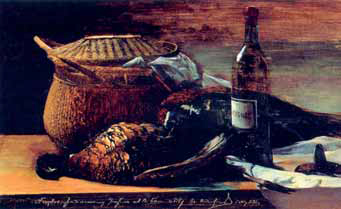 In the meantime, the painting techniques used in this segment of the picture are not markedly different from those found in other of the artist’s main works — in other words, “A View of Bougival” was reworked by the artist himself. The tests by the BS microscope showed that the artist worked in several stages in crafting the sky as well — the lower layer contains darker grey-and-blue tints, the upper layer, lighter tones of soft turquoise. Eventually it became obvious that “A View of Bougival” was a unique piece revealing Pokhitonov’s method in detail, about which Baksheev said: “he daubs away, he scrapes off, then daubs again”. But the question remains as to why others of Pokhitonov’s works, including the pieces acquired by Pavel Tretyakov, cannot serve as models too? How did it happen that the painter’s method remained so secret? The reason may be this: “A View of Bougival” is one of Pokhitonov’s earliest works, created in the late 1870s-early 1880s, when, after moving to Paris in 1877 he started his artistic apprenticeship under Alexei Bogolyubov and eagerly began to study works of the Barbizon artists. At that time he was also earnestly working to develop his individual style. 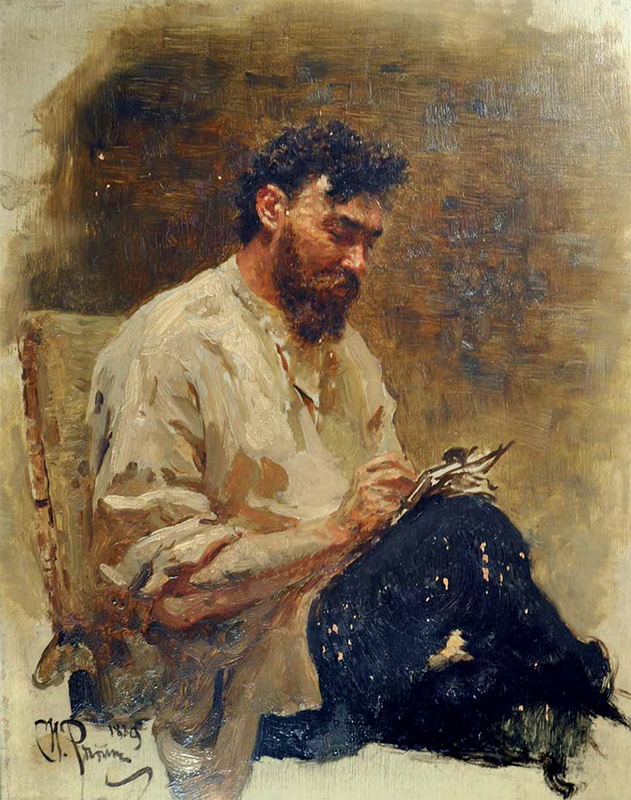 This explains why the Bougival picture reveals so plainly all of his painting techniques, in contrast to his later pieces, in which the techniques were hidden behind later intricate refinements. Ivan Pokhitonov’s grandson Igor Markevich described his grandfather’s manner of working: “The love with which Ivan Pavlovich chose panels of lemon wood or mahogany, secured horizontal planks on the back to prevent warping, and then thickly coated the panels with a dark mastic and kept them like this for up to several years before beginning work on them — such love can serve as a model of devotion to one’s craft. Finally, when the paints had dried, Ivan Pavlovich did not spare any effort to bring the painting to perfection — he polished it with fishbone, turned it over again and again in his beautiful brawny arms and caressed it, as if to lend it the warmth of his breath. We owe the unfading freshness and endurance of paints on Ivan Pavlovich’s paintings to the fact that he took such good care of the technical aspects of art.”3 Indeed, Pokhitonov’s images, into which he put so much time and painstaking effort, seem marvellously light and elegant. “How elegant, how poetic they are, how light and airy is the artful touch of the notable painter,”4 wrote the young journalist Kornei Chukovsky about Pokhitonov’s oeuvre when, in 1902, he visited a show of the South Russian Union of Artists featuring his works. 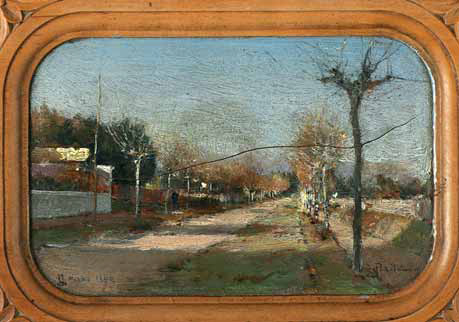 For “A View of Bougival” the artist employed an unusual material — a hardwood plank two centimetres thick, dyed on the reverse side. As already noted, the artist painted most of his pictures on carefully prepared polished mahogany or lemon tree panels, sometimes on a cardboard of golden hue, which was often brought into play in the colour design of a particular picture. Judging by two holes on the back of the panel, one on each side, the landscape reviewed could have been used as a decoration in the artist’s studio or residence, in the manner of images painted on the furniture and walls of an inn in Ganne, in Barbizon, where the Barbizon artists stayed when they came there to work. Visiting Barbizon from the late 1870s onwards, Pokhitonov could have seen their landscapes, still-lifes, and genre scenes on the doors of wardrobes, cupboards and rooms. Such images include still-lifes by Antoine Vollon (1833-1900) painted over the doors of a sideboard in the inn in Ganne (Barbizon School Museum, Barbizon). They remind us that the Barbizon artists in developing their visual language relied, among other things, on the legacy of 17th-century Dutch art. It may have been that, impressed by these pictures, Pokhitonov created the still-life “Pheasants” (1879, Radishchev Art Museum, Saratov) that is very unusual both in style and size, as well as the landscape “A View of Bougival” on a hardwood panel. 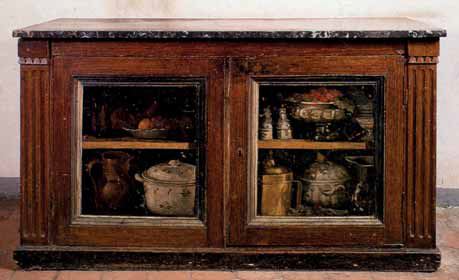 Perhaps the interior of the artist’s house featured more than one household object with images painted by him. One of the exhibits at the “The Artist-Sorcerer” show, the landscape “Alley” (1898, private collection, Moscow), on the lid of a lacquered box, indirectly confirms such a guess. Bougival, a picturesque Parisian suburb by the Seine, was very important for Pokhitonov. Living in Paris, he went there often, visiting in the late 1870s and early 1880s Ivan Turgenev at his Yaseni estate and attending soirees in Pauline Viardot’s home, where he met prominent French cultural figures. In Bougival the artist assiduously worked on sketches and landscapes. 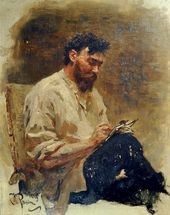 Turgenev’s journal has an entry from the end of 1882: “Besides, Pokhitonov is working on a portrait — it comes out very well and indeed resembles me. Here is a real master! He brought and showed me and Viardot paintings he made last summer — charming.”5 This statement refers to an unfinished portrait of Turgenev on which Pokhitonov worked in the autumn of 1882 (now held at the Tretyakov Gallery); among the paintings he showed to Turgenev may well have been the Bougival landscape. 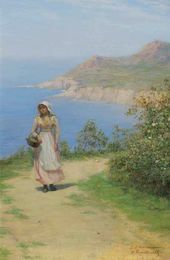 Preparing the “The Artist-Sorcerer” show, the researchers looked again at the records from the Tretyakov Gallery’s department of manuscripts, which shed light on the origin of the idea for another of Pokhitonov’s pictures, “Road by the Sea”, which has two signatures: “I. Pokhitonov” in Russian, with a flourish, and “I Pokitonow” in Latin. The artist usually signed his works in this fashion when he intended to exhibit them and offer them for sale both in Europe and in Russia. 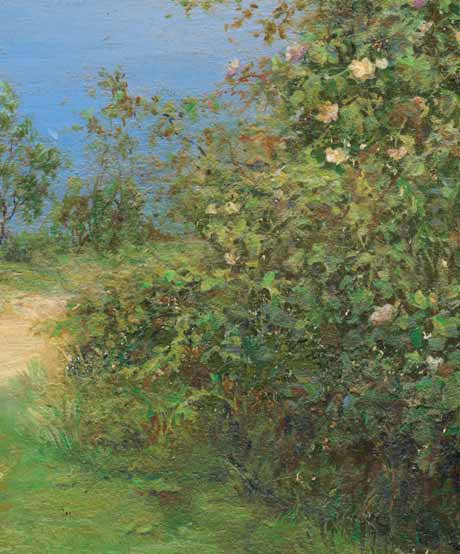 The painting “Road by the Sea” was analyzed at the Tretyakov Gallery several years ago, and the stylistic comparison, scientific analysis and the data from the art authentication department confirmed Pokhitonov’s authorship as well as the authenticity of his signatures. 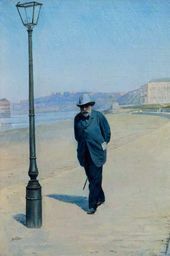 The picture has that nacreous brilliance of colours which makes it possible to call Pokhitonov a master of “tender, opalescent placidity of colour design”, in the words of Chukovsky: the tenderly blue and azure hues of the sea, with pink shots, that morph at the skyline into a mauve-and-rosy and blue film over the sky with milky-white feathery clouds, casting mauve-and-rosy reflexes on the fresh green of the grass and on the goldish-ocherous surface of the distant steep shore. Thus, the reviewed work may have been one of the pictures the artist accomplished because he wished “to try something like this”, but also in conjunction with the same offer from the Tsar. We do not know how Pokhitonov and Tretyakov proceeded with their negotiations about the artist’s intent to execute a series of images of historical and ethnographical character. In August of the same year Pokhitonov sent to Moscow five boxes with “20 small murals”, among which only the sketches “Basque Women from an Area near the French-Spanish Border” (Pokhitonov called them “studies”9) recall the preparation for the planned paintings. All of the pieces he sent were acquired by Tretyakov in the same year and now are held at the Tretyakov Gallery. Thus, “Road by the Sea”, as far as we are presently aware, is the only evidence of the artist’s unfulfilled plans. 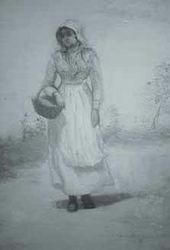 Since in the 1880s Pokhitonov lived mostly in France, and from 1893 in Belgium, the “ethnographically interesting”, “distinctive local type” was identified by subjects wearing the national costumes of those countries. It should be added that the catalogue of the third exhibition of sketches, drafts and drawings organized in Petrograd in December 1916 lists under No. 325 Pokhitonov’s piece “On a Narrow Road”. Unfortunately, the catalogue neither contains a print of the piece nor references its size, but we can only think that it was the painting under review here, which, fortunately, remained in Russia. But that is a matter for a different investigation altogether. Baksheev, Vasily. A memoir. Moscow, 1961. P. 71. Markevich, Igor. “Ivan Pavlovich Pokhitonov”. In: Ivan Pavlovich Pokhitonov. 1850-1923. A Catalogue. Moscow, 1963. P. 12. Chukovsky, Kornei. “Exhibition of paintings of the South Russian Association”. Odesskie Novosti. 1902. October 14. In: The Association of South Russian Artists. Odessa, 2000. P. 189. Grebeniuk, Valentin. Ivan Pavlovich Pokhitonov. Leningrad, 1973. P. 22. Department of Manuscripts, Tretyakov Gallery. Fund 1. Item 2745. Sheet 1. According to information provided by Valentin Grebeniuk. In: Grebeniuk, Valentin. Ivan Pavlovich Pokhitonov. Moscow, 1973. P. 20. Department of Manuscripts, Tretyakov Gallery. Fund 1. Item 2747. Sheet 2.